XXXIV, 202 p., 1 ill., 11,3 x 17,4 cm. In cooperation with Jochen Sattler. 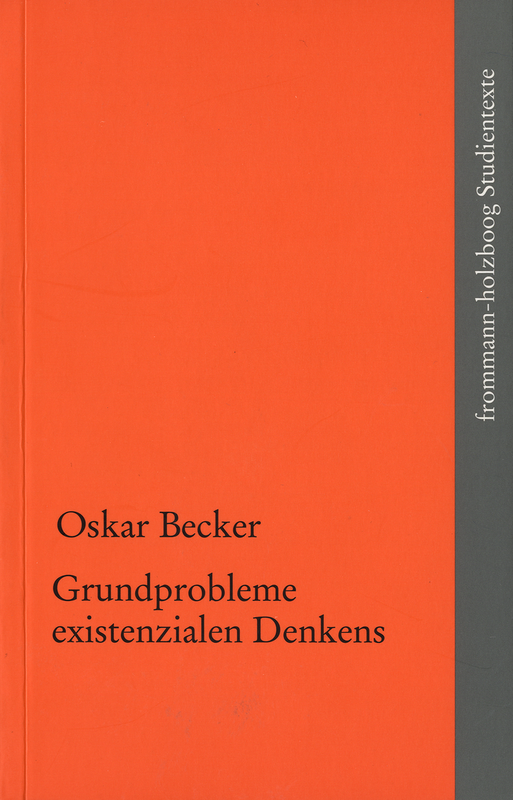 Oskar Becker, who was an assistant of Husserl in Freiburg, along with Heidegger, in the 1920s, wrote what he planned as an »introduction to philosophy« at the end of the 1940s, and this was designated to be part of the Göschen series. In this introduction, Becker provided an elementary and systematic complete overview of his concept of phenomenology which can still be read as an introduction to phenomenology on the whole today. In a critical analysis of Husserl’s psychological phenomenology and the hermeneutic phenomenology of the early Heidegger, and also in their systematic continuation, Becker developed his basic theory of the equiprimordiality of the two principles of being and essence. With his »parontology«, which referred to the various phenomena in mathematics, nature and art, he succeeded in creating a groundbreaking new concept of phenomenology.